A woman in Walnut Grove, California, has spent the last three weeks in intensive care after eating nacho cheese from a gas station. Lavinia Kelly was driving home from work on April 21 when she stopped at Valley Oak Food and Fuel gas station for a snack. After purchasing a bag of Doritos, she drizzled them with nacho cheese sauce that was available for customers. The next day, the mother-of-three went to a local hospital to be treated for double vision, according to the Sacramento Bee. 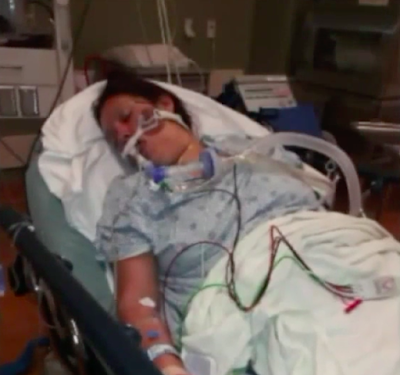 Though she was sent home, a few hours later, Kelly was having breathing problems and was vomiting. Since then, she has been hospitalized and spent her 33rd birthday on Wednesday in intensive care being treated for botulism, a rare paralytic illness. Botulism is caused by a nerve toxin produced by bacteria. Food-borne botulism typically comes from eating improperly canned or preserved foods, according to the CDC. Symptoms include drooping eyelids, slurred speech, difficulty swallowing, dry mouth and muscle weakness. The illness can be fatal and is considered a medical emergency. Kelly’s sister, Theresa Kelly, said the battle to recover has been an ordeal for the whole family. “I’ve never seen my sister, um, not have function of her body or be able to communicate. And I’ve never seen my sister on tubes or anything like that,” she told Fox40.com. Kelly is one of at least five people who have reportedly been hospitalized for botulism after eating food purchased at the gas station, according to the Sacramento County Health and Human Services Dept. Officials halted food sales at the business on May 5, according to a press release. Health officials are investigating three other probable cases and one suspected case, according to the Los Angeles Times. Although Kelly is spending her third week in the hospital, her family is hopeful she will recover. On Tuesday, Kelly’s family filed a lawsuit against the gas station in Sacramento County Superior Court on Tuesday alleging negligence, product liability and breach of implied warranty, according to the Sacrament Bee. Calls made Thursday to Valley Oak Fuel and Food by HuffPost were not returned.